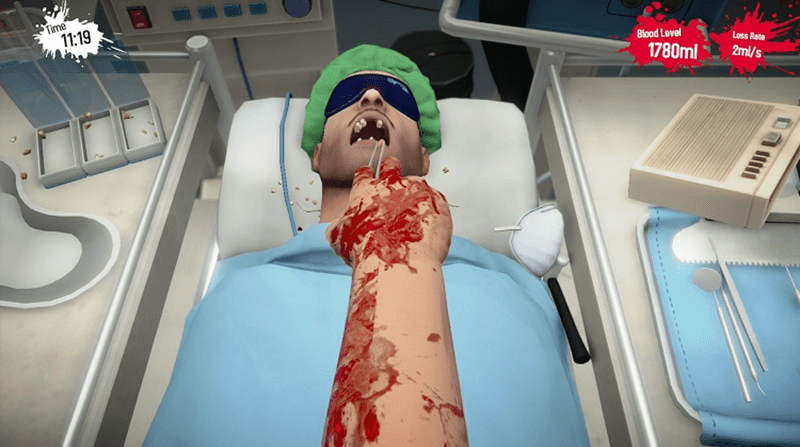 Surgeon Simulator Anniversary Edition Review – Hi everybody! 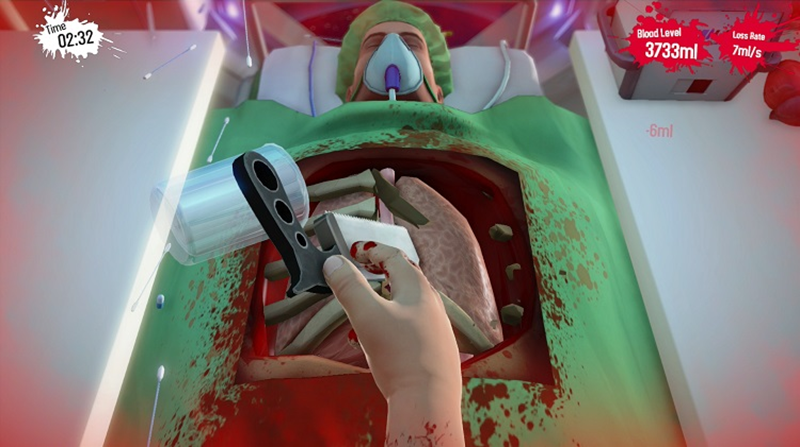 By now, you’ve all heard of Surgeon Simulator. It’s the game that YouTube won’t shut up about, a collection of botched procedures and bloody organ removal mixed with unruly controls and phantom limb syndrome. As a game, Surgeon Simulator is an absolute mess of conflicting issues that treads a fine line between fun and frustrating, but is somehow actually worth experiencing the gimmicky gameplay. The PS4 version however, could have benefited from a few more years in medical school. 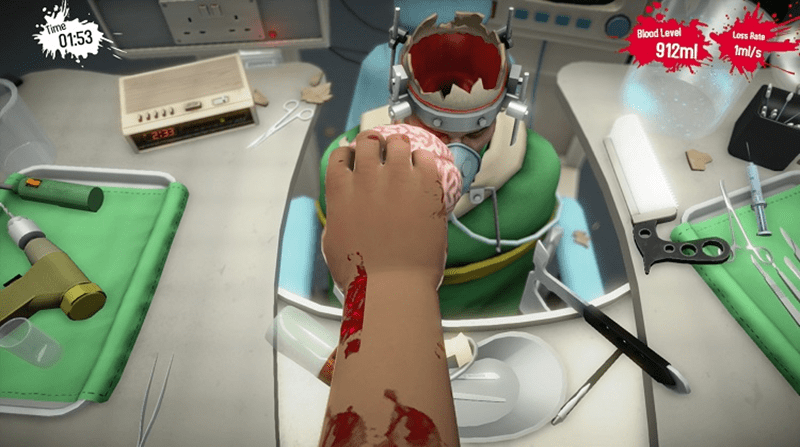 Surgeon Simulator isn’t exactly brain surgery, although players do get to do actual brain surgery during the course of several operations. 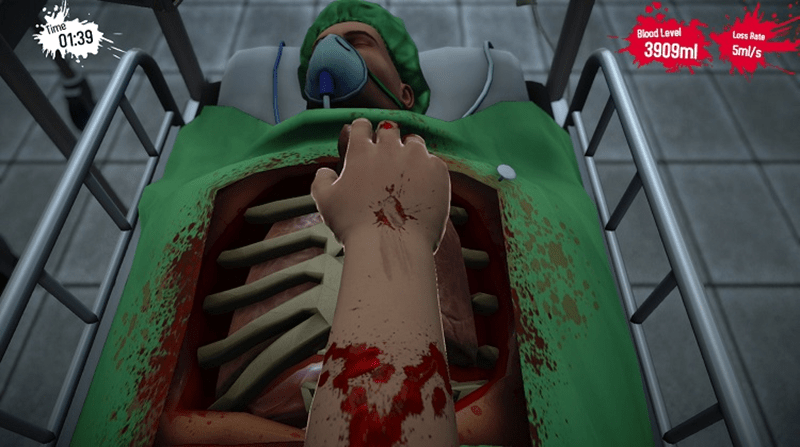 What the game is in essence, is a sandbox experience where players can fool around in the chest cavity of a victim patient, curing whatever ails them with good ol’ blunt force trauma and an endless supply of anaesthesia. And when you’re tasked with removing and transplanting organs, precision isn’t exactly a necessary tool in your operating room. As the disembodied arm of Nigel Burke, players have to move around using the left stick, while controlling the hand and its fingers with the right analogue stick and the bumpers, or the motion controls of the Dual Shock controller to control hand angles. Sound easy? It’s anything but easy. Take for instance, your standard Kidney transplant surgery. That’s an operation that requires several very precise cuts on the intestines. The only problem however, is that simplified controls or not, you’ll still be moving Nigel’s arm as if it were tied to an exposed electrical outlet. What that means, is that blood will flow, your first surgery will most likely result in you inadvertently drugging yourself with groovy effects following and you’ll wondering who left a small laser to spin around the room and burn all your equipment. In essence, there’s a lot of trial and error going on here. 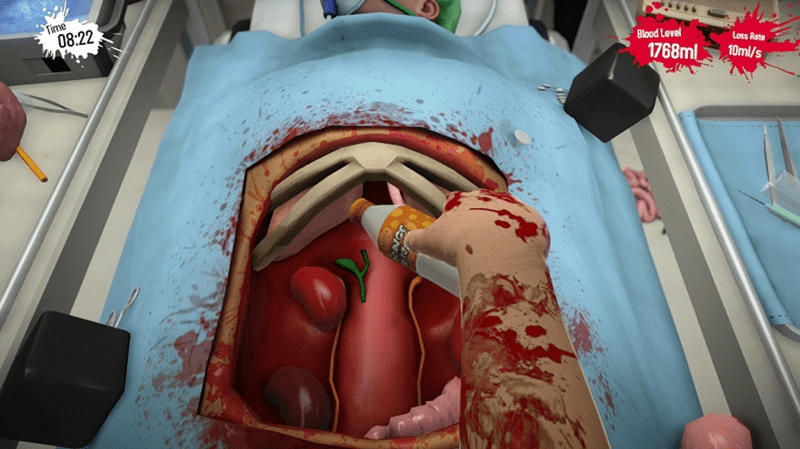 Surgeon Simulator is all about precision. Precision that is tempered by spazz hands, which results in one hell of a challenge. And that’s the gist of the game. No one will ever complete a surgery successfully on their first attempt. Instead, it’s up to you to figure out that using a bone saw to remove ribs isn’t exactly recommended and that a circular saw is a better tool for the job, while Bob suffers from your Frankenstein experiments. Once you’ve mastered not murdering Bob within the first five minutes, that’s when you actually attempt to do the surgery properly. Or scream at the TV when you botch it up. These two ideas aren’t mutually exclusive. Besides the standard surgeries which have you misplacing hearts, kidneys and brains, there’s also new eye and teeth operations, stats to track and new environments within which to apply your bloody trade. Dental operations will send shivers down your spine as you hammer away on molars and incisors while swearing to never visit a dentist again, while eye surgeries are a squeamish experience that will have you wondering if jamming a scalpel into the peepers of Bob was a good idea after all. These surgeries require all new tricks of the trade, as Nigel’s ham-fisted approach to curing what ails ya doesn’t exactly mesh well with the more subtle intricacies of removing ocular organs. And this is where the game might divide players. 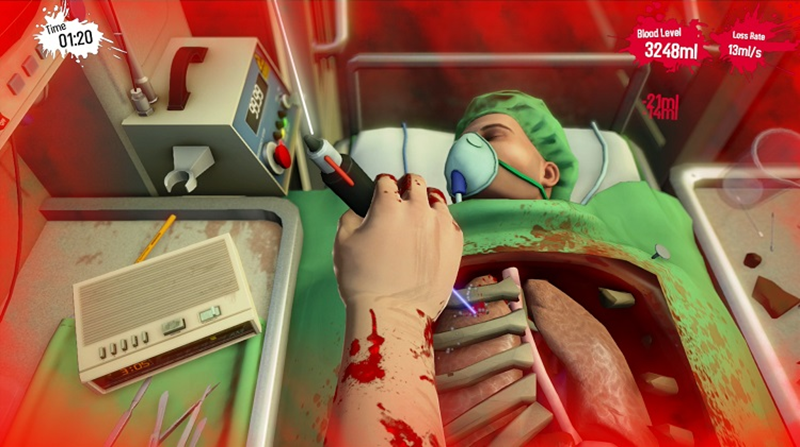 Surgeon Simulator Anniversary Edition is a punishing game. Failure isn’t just an option, it’s a part of the core mechanics of this title, with surgeries quite often ending in the death of Bob. To some, this might not be fun at all. To others, it’s worth failing time and time again just to get that one success BECAUSE DAMMIT IT JUST DOESN’T GET ANY EASIER! It’s also worth mentioning that a patch is on the way, which will double up on your arms with another player in the surgery. Because what’s better than one arm making a mess of patient, than two independent medical malpractice appendages running amok? 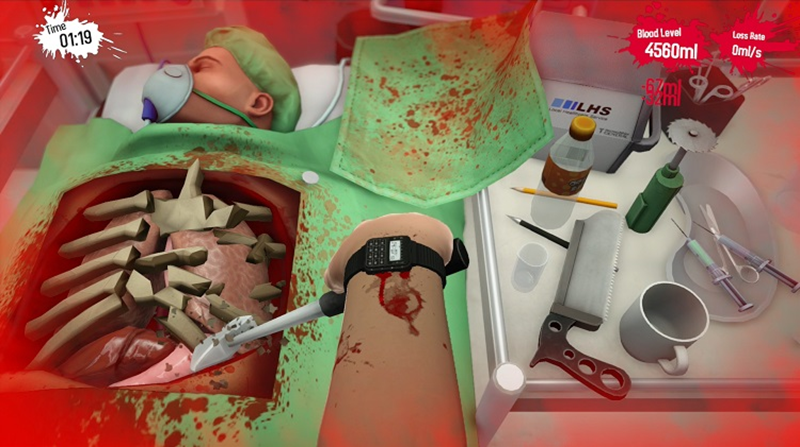 Make no mistake, Surgeon Simulator Anniversary Edition is a joke of a game. But that’s the whole point. It’s meant to confuse players, it’s meant to make you wonder if you should leave a power drill inside a lung cavity. But for folks who have already played the game on PC, it might be an old joke already. For newcomers, I’d highly recommend the madcap game, which is packed to the gills with extras and insane details resulting in grisly deaths on the operating table. For returning fans, it might be time to move on and leave poor Bob alone on the operating table.